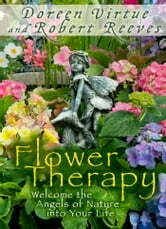 Flower Therapy is the art of working with flowers, flower essences, and angels for healing, manifestation, and abundance. With flowers as your allies, your dreams really can come true, and you’ll see that nature truly has the ability to heal! In this book, Doreen Virtue and Robert Reeves give in-depth information about 88 common flowers, illustrated with gorgeous, full-color photographs. You’ll find out about the flowers’ energetic and healing properties, discover which angels are connected to each one, and learn to associate different species with the various chakras (beyond simply categorizing them by color). In addition, there’s a loving, channeled message of guidance and support directly from each flower’s energy. Doreen and Robert also share with you new and exciting ways to work with Flower Therapy: Create custom bouquets for dear friends. Gather wildflowers to heal and deepen your spirituality. Or choose the perfect blooms for your garden to enhance your connection to the angels. They discuss flower essences, picking fresh blossoms, and purchasing floral arrangements. You’ll even be guided through energetic clearing methods and receive detailed instructions about how to perform a Flower Therapy reading. While flowers have an energy that must be experienced, it’s not necessary for you to gather any in order to do so. The photos inside, which have been infused with healing energy, are all you need to begin your journey. So, whether you have a green thumb or not, Flower Therapy can start making a difference in your day . . . and bring blessings into your life!